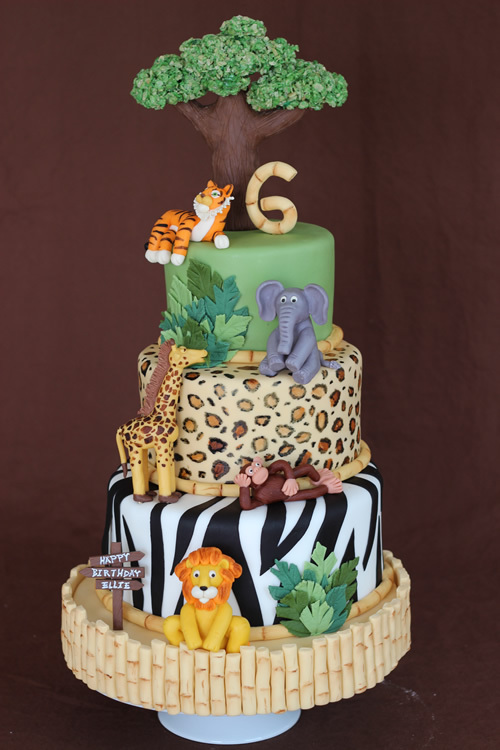 Last week I shared the jungle themed cake with you that I made for my niece’s 6th birthday. I took a lot of pictures while I worked on it so that I could share some tutorials on how I created various elements of the cake. I thought I would start off this week by showing you how I baked the animal prints inside the cake. When I was originally discussing the cake ideas with my sister-in-law, she showed me a picture of a cake that had zebra stripes baked into it and asked if I could do that with this cake. 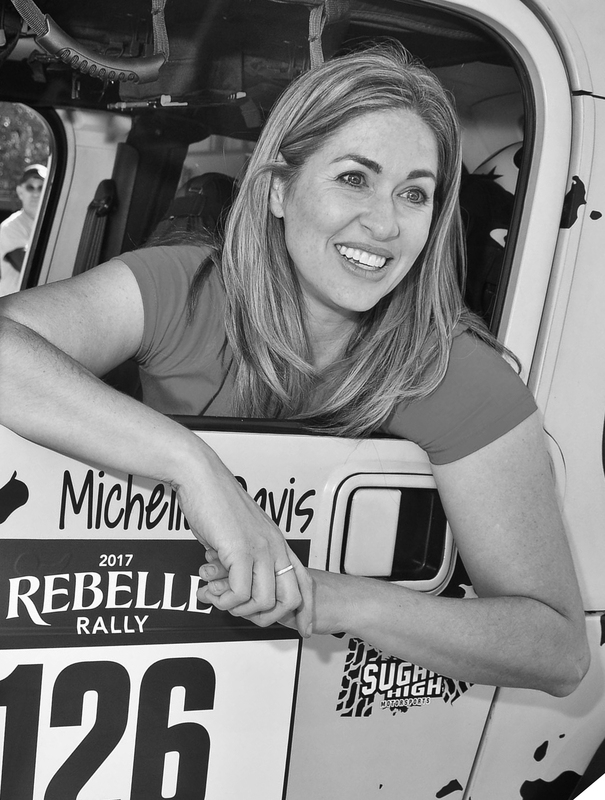 Although I had never done anything like that before I was willing to take on the challenge. I decided to take it a step further and make each tier a different type of animal print. I chose zebra, tiger and leopard. 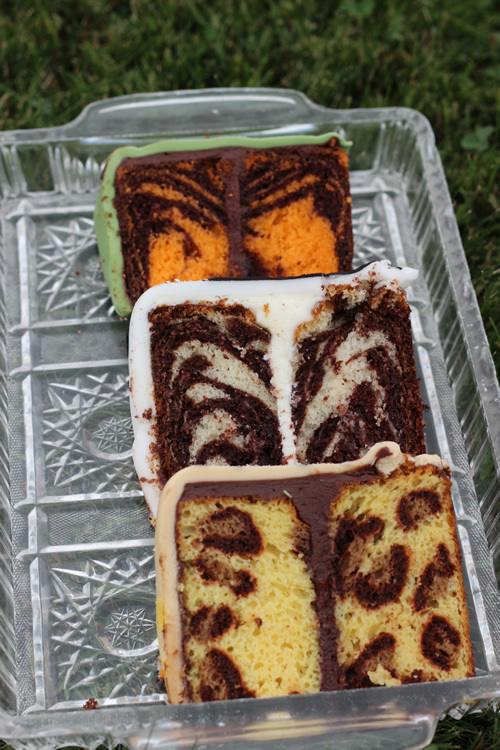 I figured that the zebra and tiger could be achieved with the same technique; I would just color the white cake batter orange when making the tiger cake. 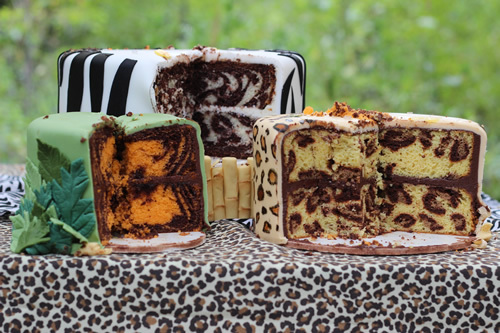 After some searching online, I came across this tutorial for the zebra/tiger striped cake and this video on Youtube for the leopard print cake. The bad part about creating cake interiors is that you don’t know if you succeeded until you cut into the cake. After I baked everything I had to just cross my fingers and hope they turned out correctly. 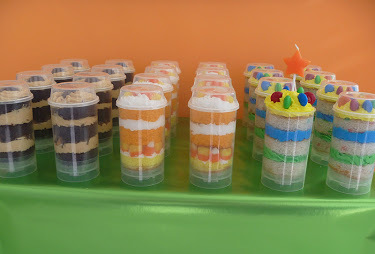 Once we finally served the cakes I saw the results and now know some changes that I will make next time. I will include my recommendations in the tutorials below. Both the zebra and tiger stripes were made the same way. I used a white cake mix and a chocolate cake mix for both of them; I just added some orange gel food coloring to the white cake when I made the tiger one. I really wasn’t that happy with the tiger one. 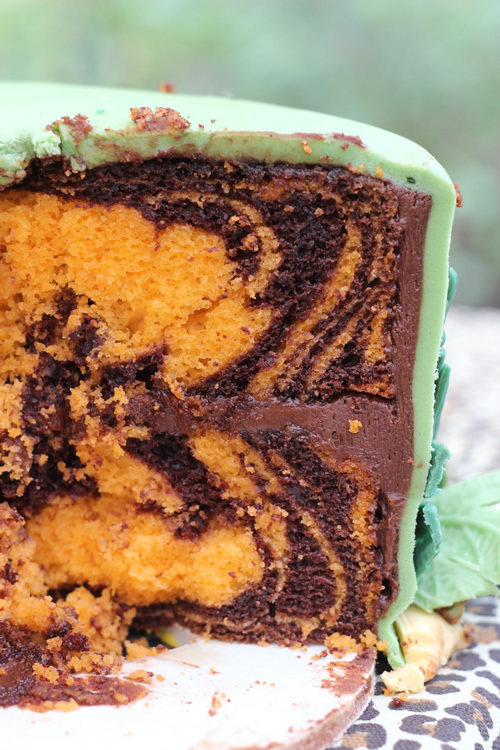 As you can see in the pictures, the stripes pretty much just formed along the outsides of the cake and the inside was mostly just orange. I think this is because I made this cake in 6 inch pans , which are obviously smaller than the 10 inch pans I used for the zebra stripes. Next time I will try using a smaller measuring cup for pouring out the batter when I use this size of pan. As for the zebra cake, I was happy with it but I would have preferred there to be more white cake and not quite so much chocolate. 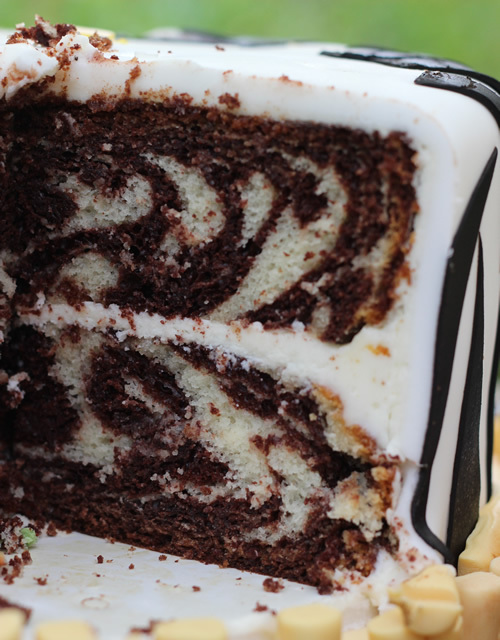 Some parts of the cake looked fine but other parts were a bit saturated with the chocolate stripes. Next time I think I will add more white cake to the pan, instead of using equal amounts of each. 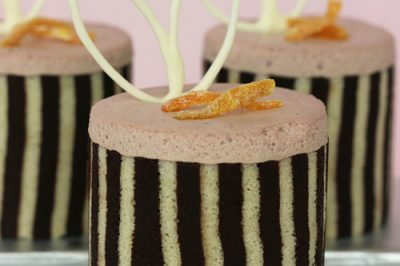 To create this look you need two cake mixes, one white and one chocolate. 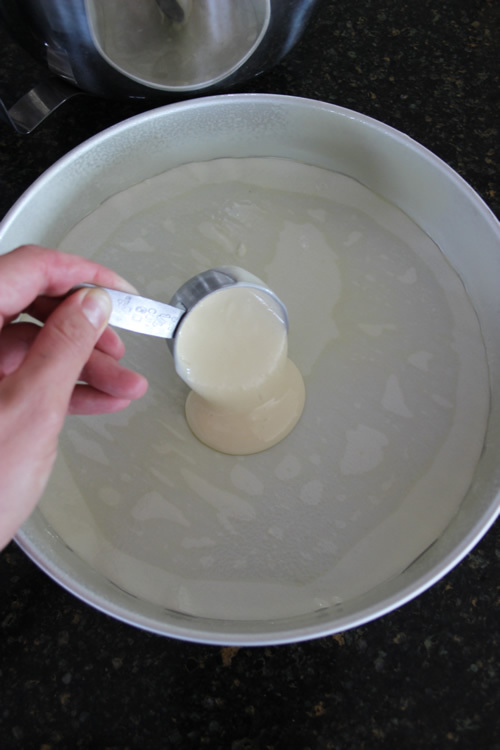 You want the batter to be on the runny side so don’t use mixes that contain pudding. Prepare the mixes as instructed on the boxes but add an additional 3 tablespoons of water to the white mix. You will now have two bowls of batter. Make sure your cake pans are prepared and ready to go. I prepared mine by spraying them with Baker’s Joy and then lining the bottoms with parchment paper . 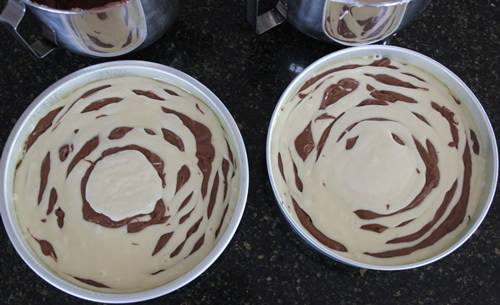 Let is spread out a bit then add a 1/4 cup of chocolate batter directly on top of it and let it spread out as well. Now add another 1/4 cup of white batter on top of the chocolate batter. Continue doing this until you have filled the pans up to somewhere between 1/2 and 2/3 of the way full. 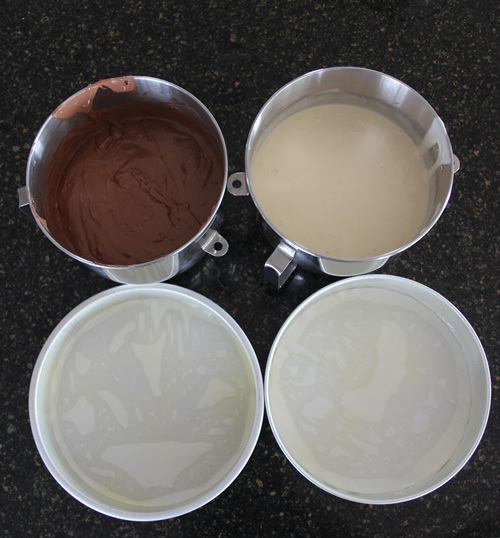 *As I said before, I think that I would prefer if there was more white in the cake so next time I think I will try increasing the amount of white increments to 1/3 cup and then using 1/4 cup, or slightly less, for the chocolate. Now bake them per the box instructions and say a prayer that they turn out right. When the cakes are baked and completely cooled, be sure to level them like you would any other cake so that they lay flat on top of each other when you stack them. I used white buttercream for my filling on the zebra cake and chocolate buttercream for the filling on the tiger one. The leopard cake turned out to be my favorite. I have to admit that I did end up baking it twice before I got it how I wanted. The first time I followed the Youtube video exactly but I just didn’t get a good feeling about it. I finally ended up cutting into the cake and, sure enough, I wasn’t happy with the results. There were only about 3 spots and they were misshaped and just not what I wanted. I thought through it for awhile then created my own technique to come up with a pattern I liked much better. The tutorial below is how I did it on my second attempt. The only problem I had this time was that I ran out of yellow batter and couldn’t finish topping my last cake with the yellow batter. Next time I will be sure to leave more of the batter yellow since I also ended up with too much of the brown batters. This is a very different technique than the stripes so you want a thick batter that won’t spread too much. I used boxed mixes again but I added some ingredients to them to thicken them up. You can click here for a printable form of the Altered Cake Mix recipe that I used to create this batter. Even though I was only using two 8 inch pans , I used two full cake mix recipes to make sure that I had plenty of batter. I also tend to overfill my pans slightly to make sure that the cake bakes up over the edge of the pan so that I get the full 2 inches of height out of it. 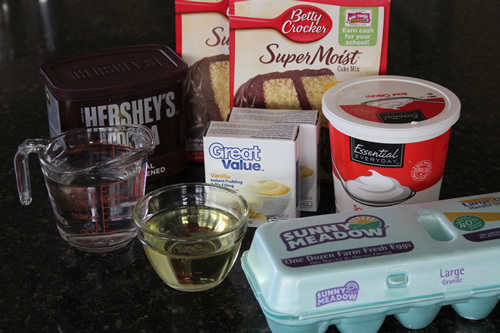 Start by making two recipes of Altered Cake Mix, using yellow cake mixes. 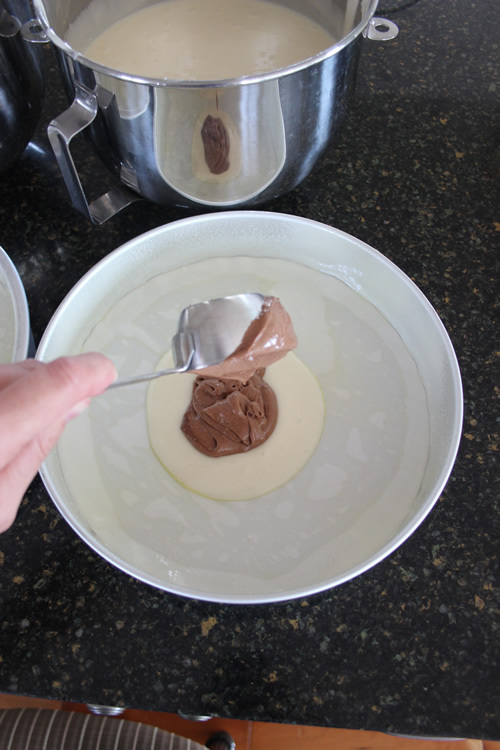 You will use the cocoa powder to color part of the batter brown. Here is where I made a mistake, I left one batch of batter yellow and then colored the entire other batch brown with the cocoa powder. I now know that you actually need more yellow batter than brown so in the future I will take about 1/3rd of the second batch of yellow batter and add it to the first batch, leaving the remaining 2/3rds of the second batch for the browns. To color the brown batters, start by adding a couple of tablespoons of cocoa powder to the batter and stir it until completely mixed in. 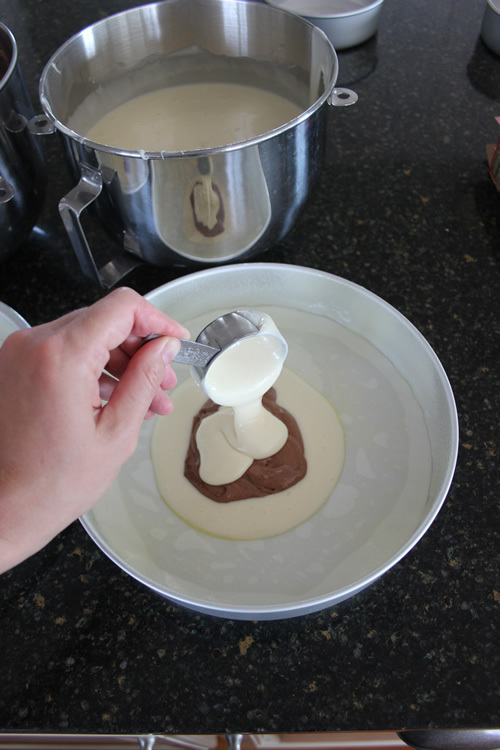 You are creating the lighter brown batter first so don’t worry about getting it too dark. Adjust the amount of cocoa powder you use according to how dark you want it. Next, remove about 1/3rd of the brown batter and place it in another bowl. To the remaining 2/3rds of brown batter, add two more tablespoons of cocoa powder, as well as some dark brown gel food coloring . Mix the batter well. This batch should be a dark brown and have considerable contrast to your lighter brown batter. Adjust the cocoa powder and coloring as needed. Place each batter in a separate large, disposable decorating bag . 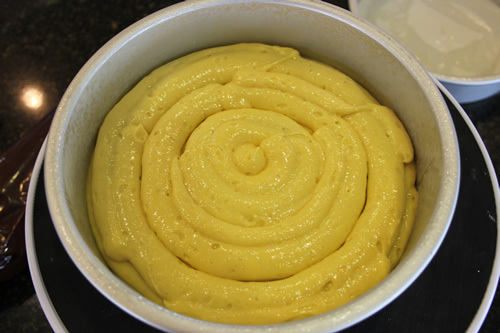 The yellow batter should be fitted with a large round tip, such as a #1A . The dark brown batter should be fitted with a #45 basketweave tip and the light brown should be fitted with a #8 round tip . Be sure to have your pans prepared and ready to go. 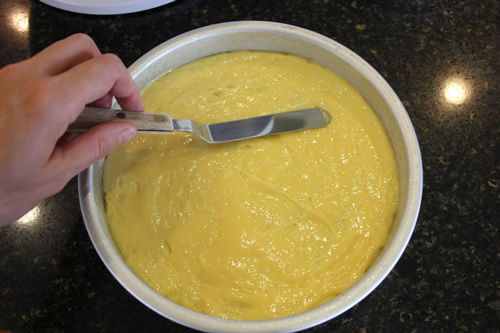 Start by covering the bottom of your cake pans with yellow batter. 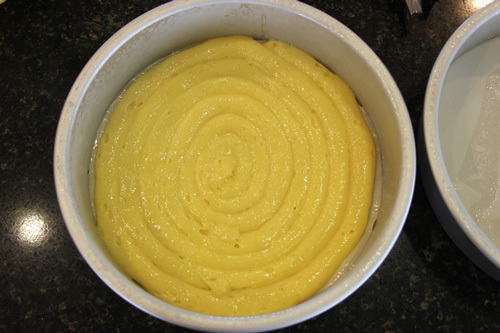 I started in the middle of the pan and piped the batter out in a circular motion until it covered the bottom. 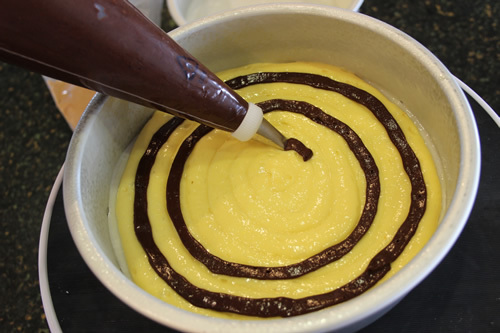 With the darkest batter and #45 tip in a horizontal position, pipe out 3 or 4 circular ribbons of batter on top of the yellow batter. 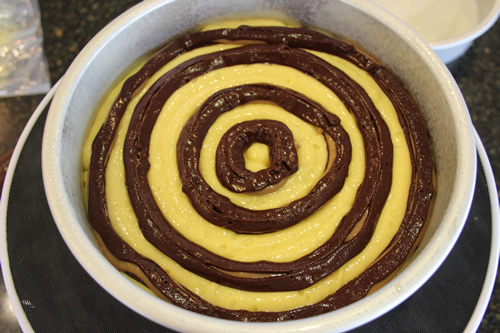 Now take the lighter brown batter and pipe a circle of batter on top of the dark ribbons. Switch back to the dark batter and pipe more ribbons on top of the lighter batter. You can have some of the ribbons completely surround the lighter batter and some of them only partially cover it. 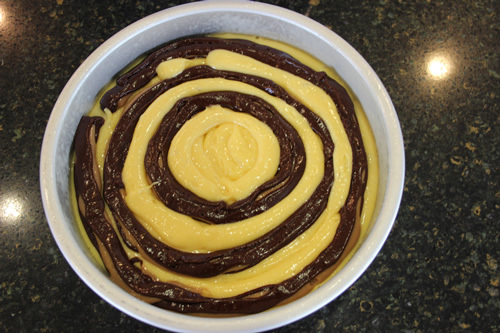 Using your yellow batter once again, fill in the empty areas around the brown batters then carefully cover all the brown batter with a layer of yellow. Repeat the process a second time on top of this layer of yellow batter. Try not to space your brown circles in the same positions as before, though. You will notice that the first time I did three circles but on the second layer I did four circles. You don’t want the spots looking too evenly spaced. 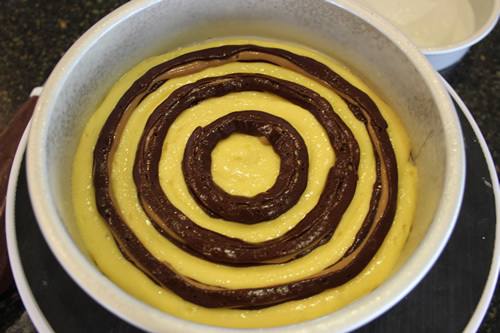 Finish up with a final layer of yellow batter to cover everything. I used a small spatula to gently spread it smooth on the top, being careful not to disturb the brown batters below. As I mentioned before, I ran out of yellow batter with my second cake so I had to leave the top of it like this. It still worked but the cake ended up having less spots in it because I had to cut off a lot of the spots when I leveled it. You can tell in this picture that the bottom part of the top cake is missing a layer of spots. Bake the cakes as instructed in the recipe. Well, there you have it; my first attempt at creating cake interiors that are as eye catching as the exteriors. There are definitely things I will do differently with each of them next time but I learned a lot and was still excited about the results. Good luck with your own attempts. I would love to see your work so feel free to post pictures on my Facebook page any time. Also, if you have any additional tips or tricks for me, please post them in the comments below. I always love learning new things. 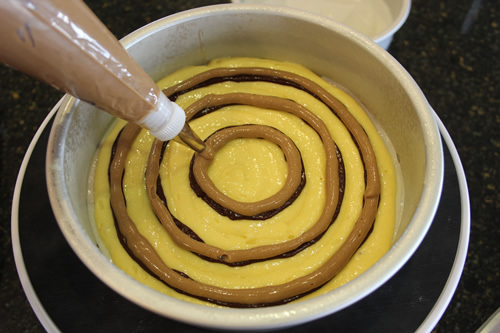 Would this technique work for a a large sheet cake If I do a lot of smaller circles instead of one big? Hi Abby, I am so sorry, but I am just now seeing this question. I never got a notice for it for some reason. Anyways, I think that would work. 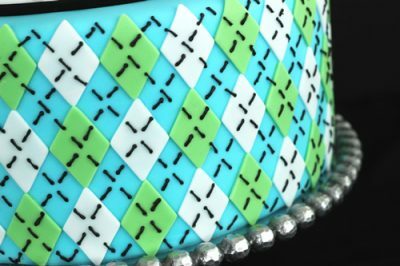 It might look a little different, depending on where you made your cuts into the cake but it would be fun to try and see. Hope it works for you. Hi there, I love these!! 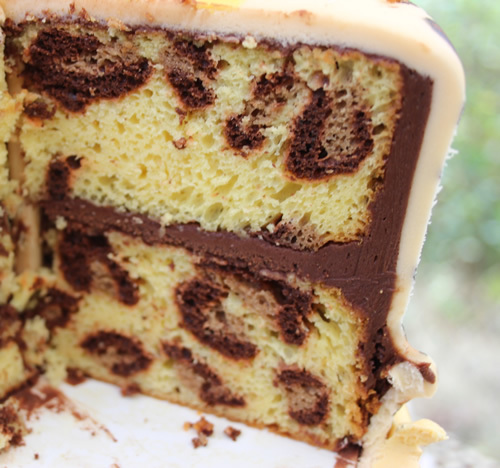 Do you think a cake with pudding in the mix would work for the leopard print cake? My son requested a leopard cake for his birthday, and a Google search led me to your leopard spots tutorial. The cake turned out perfectly! I was so thrilled with it, and your instructions made it really easy. And best of all, my son thought it was really cool. This was my first time on your blog and I will definitely be checking it out regularly. Thanks so much for putting so much time and effort into this post. Hi Kate! I am so excited to read this and so happy that my tutorial was helpful for you. Thank you for checking out my blog and hope I have other tutorials with will help you in the future. 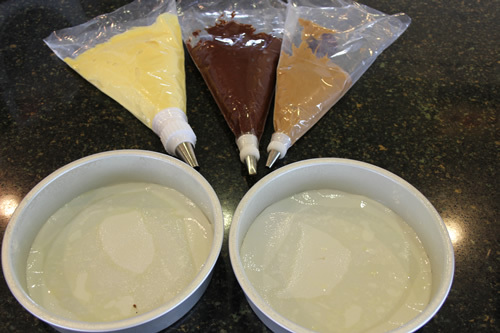 The purpose of the pudding mix is to add moisture, structure and additional depth of flavor. I am not familiar with the pudding mixes you have in Australia so I can’t say for certain if that will act the same as the mixes I have here in the U.S. If you feel like the pudding mix will be a detriment then I would just use the regular cake mix, without any additions, or a cake recipe that you are used to working with. That is just the doctored version that I do ever time I use a cake mix. I hope your second attempt is a success! Hi! Thank you so much for this tutorial!! It was clear and easy to follow! I just made the leopard cake, and I hope it looks right when we cut it. I printed leopard print on edible paper, and will cover the cake with icing and then the paper, since I don’t know how to use fondant. Thank you for the sweet comment! I’m so happy the tutorial was easy and helpful. I hope your cake turned out exactly as you wanted. It is always a mystery until you finally cut into it. Great idea with the edible paper!